The LEAP Ambassadors are always up for learning new things, and we recently were offered a trifecta of new opportunities: (1) tour the Bush School for Public Service, (2) visit the Bush Presidential Library, (3) and hear Madeleine Albright discuss her career and thoughts on the current political climate. The Bush School of Public Service is one of the outstanding graduate programs in the US, particularly in the area of public administration. Kathryn Myers, along with two graduate students, did a great job of providing an overview of the program, while also giving insight from a student’s perspective. Broadly speaking, they offer two programs: a Master’s in Public Service and a Master’s in International Affairs. For the Public Service program, additional tracks (e.g., non-profit management) and concentrations (e.g., state and local policy) are offered. One of the interesting aspects of the Bush School is the cost. Tuition and fees are about $12,000 a year and, on average, Bush School students receive $4,000 worth of scholarships annually. When you factor in the fact that College Station has a lower cost of living than most places with top-ranked graduate schools, the savings are real and substantial. The students on hand also did a good job representing the Bush School. Both indicated that the collegial, supportive environment was a big reason they enjoyed the school, and both indicated that the diversity of career options was a real selling point for them. We left the Bush School tour opened up many more options for us, and we left the School feeling excited about post-graduate plans. …the Museum opened with exhibits on Bush’s early childhood with his father, former Senator Prescott Bush, and his upbringing. One of the things that distinguishes President Bush from average citizens–and even other Presidents–is the diversity and richness of his career. One of the highlights, for example, was President Bush’s years in the military. President H.W Bush served in World War II as a Naval Aviator in the Pacific Theater of the war. His bomber was shot down over the Pacific during a mission, and the exhibit displays an exact replica of the Bomber he flew. He was in this type of plane–The Avenger–in 1944, when he was shot down and had to ditch his plane at sea. While he parachuted out and survived, his crew mates perished. In 1945, President Bush married America’s future First Lady Barbara Pierce. This young couple then embarked to Midland, Texas, where Bush began his oil career and entree to a political life. After two unsuccessful runs for the Senate and one four-year stint as US Congressman, Bush held a series of foreign policy positions, all of which were addressed in the Library: Ambassador to the United Nations; US Ambassador to China; and then Director of the CIA. His role as Vice-President in the 1980s, further raised his profile, and burnished his foreign policy resume, as President Reagan often utilized Bush in a foreign policy role. The Library opens his presidential years with a replica of the Oval Office–and they allow photos at the executive desk! …a room highlighting the end of the Cold War–on that features a large slab of the Berlin Wall; and a very large exhibit on the Persian Gulf War. Although our tour was short on time, we came away with a lot of knowledge, and a deeper appreciation of President Bush and his role in shaping the 20th century. Another shaper of (very late) 20th Century history was Madeleine Albright who, in 1997, was named the 64th Secretary of State. As the first-ever female SOS, she became the highest-ranking female official in US History. Secretary Albright has since served as chairperson for the National Democratic Institute and as a member of the U.S. Defense Department’s Defense Policy Board, and eventually became a New York Times bestselling author. Secretary Albright was at the Bush School for a book signing and discussion over her newest bestselling book Fascism: A Warning. 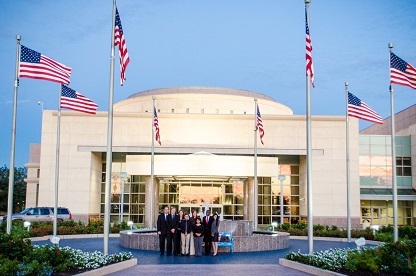 While the Bush Presidential Library was hosting Secretary Albright, the World Affairs Council worked with the Library to obtain a block of tickets, which were then offered to members. The LEAP Ambassadors joined the World Affairs Council in this book signing and got the special chance to meet Secretary Albright and have our books personalized! Finally, the group gathered with the World Affairs Council again to listen to Secretary Albright discuss her book and ideas of the future. The moderated discussion was a series of questions where she discussed her upbringing and how it related to where she is today. Her message was clear: There is still a path for American interests abroad through diplomacy. She warned that there are those who believe in American Superiority without diplomatic resolutions, and that these people do not understand how to conduct American foreign policy. After the event, the LEAPsters ate dinner at Tanaka Ramen, a noodle bar located in College Station. The students devoured their dishes as it was the first time for many to have the real thing–as opposed to the inferior 25 cent instant ramen. For dessert, they enjoyed Mochi balls, a delicious spherical dollop of ice cream encased in frozen dough. Of the six flavors ordered, red bean seemed to be the unlikely favorite. After the delicious dinner of noodles and broth, the students rode home in anticipation of the election results that night! 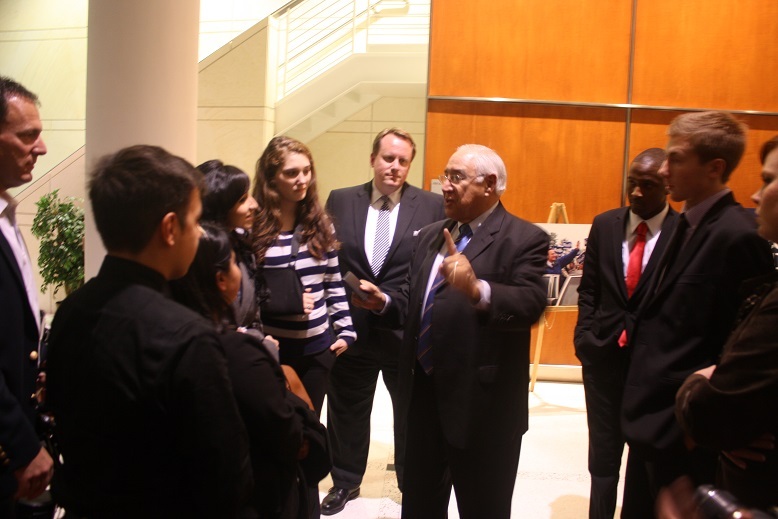 The LEAP Center would like to thank the World Affairs council for allowing us to attend this event with them. This has made such a large impression on us students and they could not have had this opportunity without them. We look forward to working and attending many more events to come! As this is my first trip with the Center for Law, Engagement, And Politics (LEAP), I honestly have no idea what adventure is in store. But the first day has been intriguing, insightful, and more importantly, easy! Now while I do not expect the rest of the trip to be this languid I am definitely enjoying the six-hour drive to Norman, Oklahoma. This afternoon, we left the Walker Education Center in Huntsville, with a few extra LEAP Center students in tow, for College Station and the Bush Library to attend the kickoff event for the twenty-fifth anniversary celebration of President George H. W. Bush’s election. 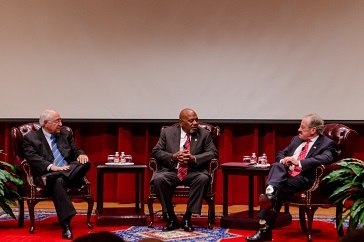 Moderated by the CEO of the Bush Presidential Foundation, Fred McClure, we had the pleasure of sitting in on the discussion by President Bush’s former personal photographer, David Valdez, and President Bush’s campaign manager for the northeast area, Ron Kaufman. Through their storytelling it was clear they both deeply respect and admire President Bush. Mr. Valdez spoke of how even though the former President was a naval pilot in World War Two and could use that to win votes in his campaign, he was reluctant to do so. He was also similarly reluctant to use showcase his religious beliefs to appeal to the emerging Evangelical vote. Both speakers knew the details of President Bush’s life and testified to his character during the campaign. It was a great experience to hear first hand the stories about a man who did much for this country! It was also a pleasure to spend time with some students who couldn’t make it on the trip. Joey Medrano, Ariel Traub, Quan Hall, and Clinton Morrison, also attended the event, had dinner with us, and then returned to Huntsville. And we were especially pleased that Gene Roberts, Director of Legal Services at SHSU, came with us for the evening’s festivities. Now, after enjoying a filling meal from Blue Baker on a chilly November evening, we make our trek towards the University of Oklahoma to attend the Oklahoma Political Science Association Annual Conference. If today is any indication of how the rest of the trip will go, I am stoked! We should arrive at the hotel around three am to wake up and get going again around six. Looks like I better enjoy the relaxation while it lasts. Looking forward to tomorrow’s stimulating adventures! As temperatures were dropping below 50 degrees in Huntsville and our excitement for this new learning adventure built up, we commenced the first day of our trip to Oklahoma with a quick visit to the George W. H. Bush library. The Library was celebrating the 25th anniversary of the election of George W. H. Bush as President of The United States of America. 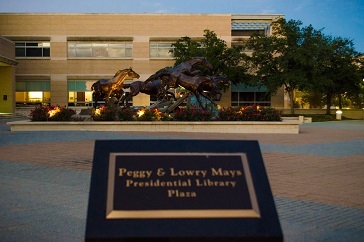 Upon entering the library grounds I noticed the beautiful “The Day the Wall Came Down” installation of five horses was taking with the reflection of the sunset. We were politely greeted by neatly uniformed students of the Bush School and directed towards the auditorium. Ariel, Zachary, and I sat in the third row right behind the reserved spots which were occupied by the State of Texas Supreme Court judges, the College Station Mayor, and a couple of State Representatives. 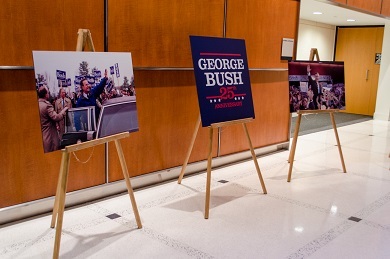 The program began with a slideshow of historical and energizing photographs of Bush Sr. and his loved ones through his campaign. Then we heard a moderated talk with David Valdez, the former Presidential photographer, and Ron Kaufman, Bush’s campaign manager of the northeast region. They both emphasized the approachable and sincere personality of W. H. Bush, but they also pointed out some of the bumps on the road they crossed. For example, when the then President elect was confronted by Dan Rather in 1988, a mini-controversy erupted. This event, according to Kaufman, helped turn the 1988 campaign around and helped Bush win the election. We were also fortunate to have time to speak with Valdez, and he expressed interest in visiting SHSU at some point, a prospect that excited all of us. We concluded the night by arriving to Norman, Oklahoma at about 3 am with even lower temperatures than Huntsville on the mid 30’s. We commenced our five-day trip to Oklahoma by making a small detour at the George H. W. Bush Presidential Library in College Station, Texas. 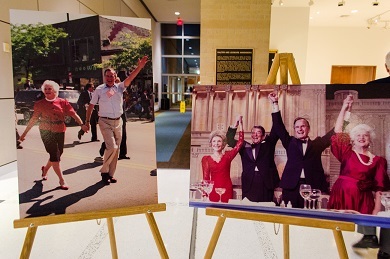 The George Bush Presidential Library Foundation kicked-off a yearlong celebration of the 25th Anniversary of then Vice President George H. W. Bush winning the Presidency in November 1988. 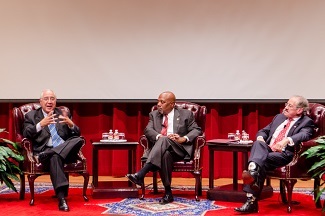 The event featured two key speakers who played a key part in the election of President H. W. Bush. One was the northeast regional political director of the Bush Campaign, Ron Kaufman. He operated in Boston, Massachusetts, home of Michael Dukakis, Bush’s opponent. Kaufman gave great insight on the strategy in keeping a headquarters in Boston. He explained it was a way of prompting Governor Dukakis into thinking he could lose his own state, forcing Dukakis to spend a large amount of time in Massachusetts. David Valdez, the second speaker, was the personal photographer for President George H. W. Bush. Valdez documented every step of the election with photography. He spoke about how the campaign struggled with the media, most interesting the showdown between Dan Rather, CBS reporter, and Bush. During the interview, Rather attacked Bush on the controversy of the Iran-Contra incident under the Reagan Administration. The live televised interview helped the campaign because it showed critics that Bush was not “soft,” but an actual contender who would fight back when attacked. Both the speakers did a fantastic job in giving glimpse of what went on behind the scenes of the election, and we are grateful to the Bush Library for the great job they did putting the event together. Day one of our whirlwind trip is now in the books. 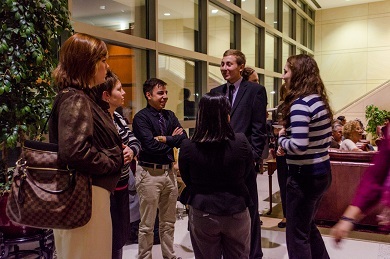 Our fist stop as part of our trip to Oklahoma was in College Station to an event at the Bush Library. The focus of the event was a 25th anniversary celebration of President Bush’s ’88 election victory. The two speakers were David Valdez, Bush’s personal photographer and Ron Kaufman, a longtime campaign adviser. In the audience with our group were some other notable dignitaries, including multiple Texas State Supreme Court Justices, Texas Congressmen and local city councilman. These dignitaries bring their own perspectives and stories, which really add to the discussion as well. The two main speakers were perfectly suited for the discussion, with each bringing a different perspective of the campaign. Valdez let the audience in on personal stories about himself and Vice President Bush. Meanwhile, Kaufman described the campaign in a larger context. Now, having made the most of our trip to the Bush Library it’s now time to drive though the night to Oklahoma City, another day of opportunity awaits in the morning.